It would be easy to list all the achievements of Dr Rowse, but as his Bibliography is simple to find online along with his many honours, I don’t need to add to them. Instead, I shall add here, a few links and comments not readily available elsewhere. I include a copy of the photograph and postcard I discovered in a book I bought, along with a copy of a letter. In another blog about him on this site, I wrote that many of his peers had a problem with him and his attitude. But these personal notes show that he had many friends and admirers, who thought of A L Rowse as a clever boy and kind man. On a postcard sent to Mrs. Richard Hatchwell of Chippenham on 27th March 1980, he wrote. You are both sweet to me. Delighted to have G’s book. I have most of his but this will make it complete. I have a Corn Childhood for you, but now when you come down will have some early Vols of Poetry O.P. + unobtainable instead. You must go and see this place near Totnes. Nice old town too. Splendid! Medieval house and gardens. Love Leslie. Richard and Mary Hatchwell were great friends of his and the interview and obituary below describe Mr. Hatchwell as the well known and respected antiquarian book seller that he was. The house he insisted they visit was Darlington Hall at Totnes. A L Rowse loved grand houses and the grand families who lived in them and was friends and acquaintances with many in that circle. He was allowed access to many private libraries and family papers in order that he could complete the required research for his books. If anyone reading this wants to discover historical facts written in a flowing and easy to understand style, then read A L Rowse. He researched in great detail and his knowledge was second to none, especially with regard to Elizabethan, Carolean and Jacobean history. A letter he wrote to them from his home at Trenarren on 25th October 1994, shows their easy friendship. Slow in sending you my horrible Regicides. But hope you approve my Shakespeare article in Daily Telegraph Week End Supplement, Oct 22. All my friends are having ops, and Phyllis shingles – worried with re-decorating after dry rot! No worries of that sort when I lived in College. College life for me. Wilts is not so damp as Cornwall – so hope you are spared re-decorating and shingles. Phyllis Candy was his housekeeper and looked after him for years. She was very protective of him, although Dr. Rowse was perfectly capable of looking after himself. If you want to hear his voice, there are some lovely recordings on the BBC Archive website. and lately on You Tube. 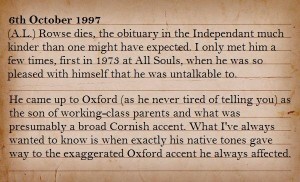 He had such a wonderful speaking voice, which he honed himself at Oxford. He was never ashamed of his Cornish roots or the thick accent, but he needed to be taken seriously. He found himself mocked for having improved himself by some of his contemporaries, but he did not let it bother him unduly. 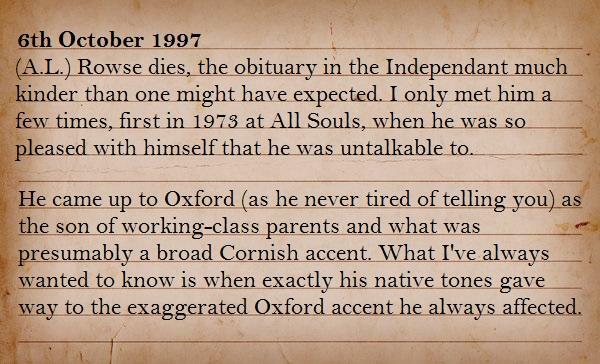 Alan Bennett wrote a particularly cruel and unnecessary obituary about A L Rowse, soon after his death. Some of Rowse’s friends have also written books about him and all talk of him honestly and with great affection. Although a prolific and brilliant writer, his peers did not praise or revere him as they should have done. Dr Rowse certainly had a high opinion of himself and I feel the resentment he sometimes felt didn’t help his humour. A L suffered for years with stomach ulcers and in spite of medication and operations, at one time it was thought that he would die. He seemed to live in a perpetual state of anxiety and perhaps a psychologist would point to the difficult relationship he experienced with his parents. We may decide, upon learning that a local butcher, Fred May , one day found it highly amusing to temporarily imprison the young boy inside a warm carcass, that here was another reason to create an underlying anxiety. There was also a strong rumour, not without foundation, that Fred May was, in fact, his real father. Sadly, in the end Rowse acknowledged that he was probably fathered by the butcher. He did visit some of the May descendants during one of his many USA lecture tours, but found little in common. A L Rowse had no patience with some members of his family and neighbours in the small, tight community of Tregonissey. When he discovered that his eldest sister was born before his mother wed his father, he romanced that he was really the son of a St Aubyn. His mother had worked for them at St. Michael s Mount. The girl’s father was probably the daughter of a doctor where Rowse’smother had worked as a maid. 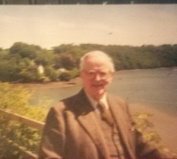 As he was writing one of his books when living at Polmear Mine, his house overlooking Sr. Austell Bay, he noted that there was no one now left in Tregonissey from his childhood. That tight community had lived and worked and argued together for generations, but were now all gone. He experienced nostalgia as much as any of us do. The personal reminiscences of his friends in the books detailed above confirm that his real friends and family genuinely loved and respected him. I am glad about that. I think he enjoyed his life and made sure that he got as much of of it as he could. Can everyone say that…. I am seriously thinking about starting a campaign to have Dr. Rowse properly recognised for his great works.